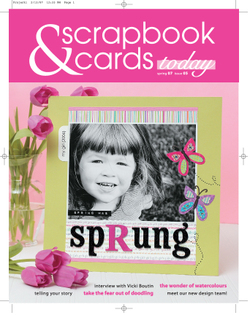 The spring issue of Scrapbook & Cards today has arrived at PE. You can pick up a copy for FREE with any purchase at PE or we can ship it to you with your order. (while supplies last) This great magazine is also available as a FREE DOWNLOAD (this issue is so big it is in 2 download parts!). • the wonder of watercolours – love the look of watercolours but afraid to try? have we got some tips for you!